- Fur Description: Natural Light Mahogany Mink. Dyed Brown Fox. - Fur Origin: Denmark, Finland. - Mink Cape Length: from neck to hem at center back: 19" . - Due to natural pelts, slight variation in brown tones may result from pictured cape. - Cape also available in ranch (black) mink, white mink and twilight gray. A stunning mink cape trimmed in luscious fox is a gorgeous finishing touch for every elegant event! 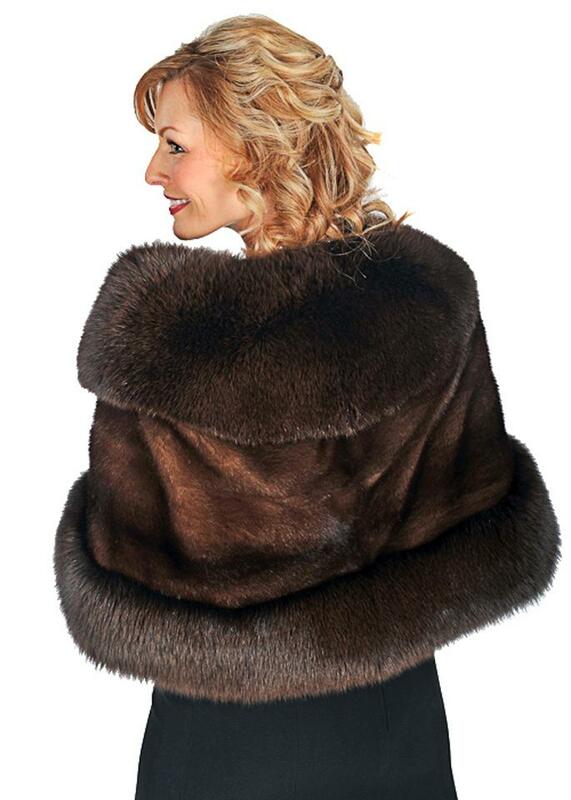 Feel pampered and precious in this lovely fur wrap in a classic style that is always appropriate. Wear it over your most sophisticated ballgown or over a simple dinner suit. Rich, glowing, mahogany mink and fox is a combination that will always be in the forefront of style and in superb taste!